"A soft chewy cookie with lots of extra goodies." In a medium bowl, cream together the shortening, brown sugar and white sugar. Stir in the egg and vanilla. Sift together the flour baking powder and salt, add to the creamed mixture and mix well. Finally, stir in the nuts, corn cereal and quick oats. Drop dough by heaping spoonfuls onto the prepared cookie sheets. Press down slightly with a fork. Bake for 12 to 15 minutes in the preheated oven. Remove from cookie sheets to cool on wire racks. This is a very simple recipe. My 19month old helped to make them and loved eating them. I did use butter instead of shortning. Other than that we stuck to the recipe and they turned out awesome. 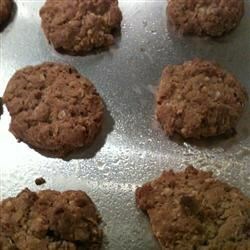 These were very good, made with Almonds instead if Walnuts. Will make these again!